The highly-anticipated crossover between Flash and Arrow is almost here, starting on Tuesday night’s episode of The Flash and continuing on Wednesday with Arrow. 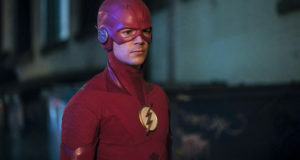 On the press line for the Flash/Arrow screening held in Los Angeles last weekend, we spoke with Executive Producer Andrew Kreisberg about the crossover – and how it stacks up against other famous crossovers of TV history. Bringing the characters together in the Flash chapter – and possibly the man behind their fight – is one of The Flash’s sillier villains. 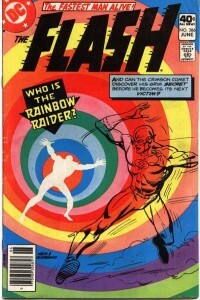 “We have the Rainbow Raider, Roy G. Bivolo, who is one of the goofiest sounding and looking villains in the Flash comic books, but I think we’ve actually rehabilitated him. We’ve made him pretty damn scary. Cisco usually comes up with the names for the villains, but in this one, it’s Caitlin, and I think that’s why we end up with the slightly sillier name,” Andrew tells us. What else makes this 2-parter stand out? “Both episodes are really funny. It’s probably the funniest episode of Flash we’ve done. Just getting to write so much comedy is a real blast. 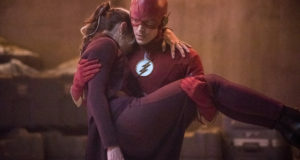 I think just watching these characters getting to interact with each other, and watching Barry and Cisco and Caitlin and get a taste for why Oliver and company live in a very dark world… and then conversely, watching the Flash characters kind of take the piss out of the Arrow team about why they’re so serious all the time. Both shows really speak to each other, and comment on each other, and both really advance the stories of both series. It feels to us like it achieved everything that we set out to do,” he enthuses. On a much more serious note, though: Harrison Wells seems to know a lot about the DC Universe. Is he aware of Oliver Queen and his green-hooded alter ego? “There’s a couple of surprising moments with Mr. Cavanagh in this episode that will certainly make fans happy,” Kreisberg teases. 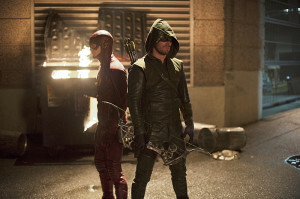 “Flash vs. Arrow” and “The Brave and the Bold” are almost here! 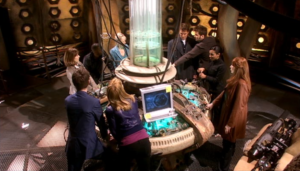 See some preview images from both episodes here.